A roundel made in Fetter Lane, presumably in the late 19th/early 20th century. Mr Dearlove is listed as a ‘whitesmith’ in the old trade directories of the time. In the mid-20th century Fetter Lane had an ice cream factory, and later Red Rhino records had warehouses there. Photos taken in Red Rhino’s premises in Fetter Lane are on Facebook. Any Fetter Lane/Red Rhino/Capaldis memories/thoughts welcome. 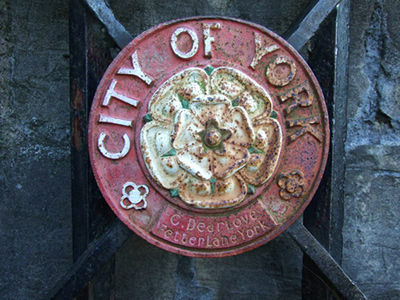 Doubt anyone has memories of Mr Dearlove’s whitesmith’s business, but he made a very handsome roundel for one of the gates of our city walls.